Though the ships had turned and gone back, the threat still existed. Many ships were still headed for the quarantine line, just five hundred miles from the shores of Cuba. 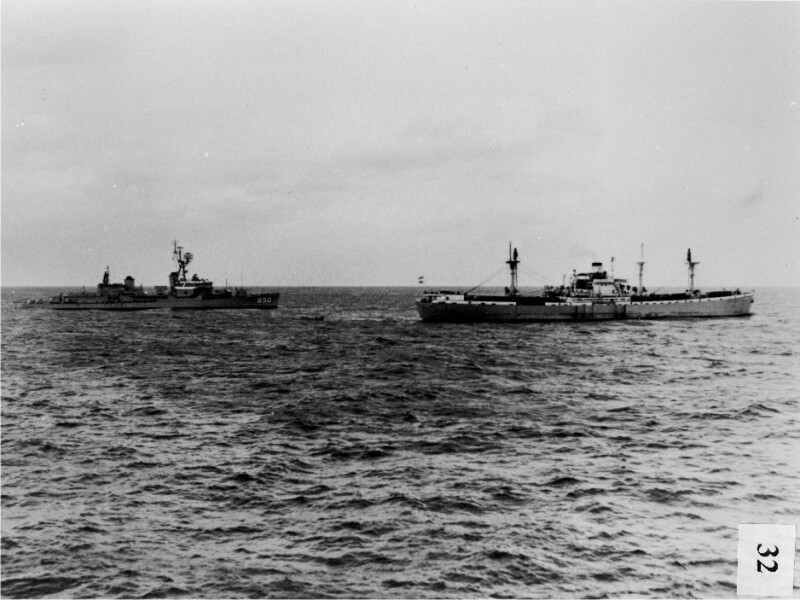 One of these ships was the Bucharest, which was a tanker so it technically was allowed to cross the quarantine line, but many of the President’s advisers suggested he demonstrate his will by boarding the tanker anyway. The President considered the advice, but determined that the demonstration of will was not worth the potential risk of retaliation from the Soviet Union. It was about this time that the President received a message from Bertrand Russell, a noted British pacifist, who condemned the President for his warlike stance towards Cuba. The President quickly sent back a message that read: “I think your attention might well be directed to the burglar rather than to those who caught the burglar.” (Kennedy, 57) The President’s refusal to commit to an action that might force Khrushchev to retaliate with force made Russell’s accusation seem all the more absurd. The first ship to be boarded was the Marucla. Interestingly, one of the two destroyers to stop the Marucla was the Joseph P. Kennedy, Jr., named after the brothers’ deceased older brother. The next ship to be inspected was an East German passenger ship. Several more ships, none deemed to be particularly dangerous, were also forced to stop. In conducting these stops and searches, the President was sending a message to Khrushchev: We’re serious. After two days of enforcing the quarantine line, the President decided that it was time to apply more pressure on the Russians, but not to much pressure so as to force Khrushchev’s hand. Part of that pressure included low-level flights over Cuba by U-2 spy planes. Meanwhile, the President ordered that preparations be made for a post-invasion Cuba, including preparations for establishing a new government. That Friday evening, around six o’clock the President received a letter from Khrushchev. The long rambling letter seemed to have been written by either a drunk person, or someone under extreme stress. “Bobby Kennedy picked it up,” George Ball said. “We were all sitting around… we had been quite exhilarated getting the first message, which was a very earthy message.” (Strober, 399) Though the letter provided some measure of hope, there was still concern because they, according to Dean Rusk, “thought the old man was losing his cool. But nevertheless, there was in the letter a sentence or two that seemed to offer a possibility of a peaceful settlement.” (Strober, 398) The letter itself indicated that Khrushchev was not writing an official correspondence; this was a direct and personal appeal to the President. At one point in the letter, he expressed regret for actions that may have provoked a confrontation that could end in war. In the letter, he offered to withdraw the offending missiles in Cuba if the U.S. would promise not to invade the island. He even suggested that the U.N. be responsible for overseeing the removal of the missiles. “If indeed war should break out,” he wrote, “then it would not be in our power to stop it, for such is the logic of war. I have participated in two wars and I know that war ends when it has rolled through cities and villages, everywhere sowing death and destruction.” (Kennedy, 67) Despite the fears, Khrushchev still placed the blame on the U.S. for its aggressive policies towards Cuba. He ended the letter by saying that the Soviet Union was ready to untie the knot of war if the U.S. was equally willing. Bobby Kennedy recalled going home that evening, for the first time, with a real sense of optimism, though by the next morning that sense would vanish. Not only did J. Edgar Hoover report that the Soviets were planning to destroy all their documents in New York that were related to the missile build-up, but on that Saturday morning, October 27, a second letter had come from the Kremlin over the teletype. This second letter was far more demanding and hostile than the previous letter, which had been written in haste. This dramatic shift in tone lead them to think that Khrushchev might have been overthrown by the “hawkish militants” in Khrushchev’s government (O’Donnell, 336). The second letter demanded a quid pro quo: the Soviets would remove the missiles from Cuba if the President would remove the Jupiter missiles from Turkey. The President was privately furious over the fact that these missile were being used as leverage against him. He had ordered Rusk to get those missiles out of Turkey on several occasions, but Rusk demurred, saying that the Turks would not be happy with such a move. Bobby recalled that his brother “believed that he was President and that, his wishes having been made clear, they would be followed and the missiles removed. He had therefore dismissed the matter from his mind.” (Kennedy, 72) The President went for a walk in the Rose Garden and was joined by Kenneth O’Donnell. The President asked that O’Donnell figure out the date of his last request for the removal of those Jupiter missiles, “and not just the first five times!” (O’Donnell, 337) At this juncture, he could not forfeit the missiles and upset his NATO allies, who would undoubtedly feel as though the President were selling out their safety for the safety of the U.S. He could also not remove the missiles under threat from the Soviet Union in a crisis that had been created out of their duplicity. Events were unfolding in such a way that the military were gaining the courage to press the President for an immediate air strike. The quarantine, they argued, was proving to be ineffective, as they had predicted. The only sure way to remove the missiles was with an air strike on Monday, followed by an invasion. During this Saturday meeting they also learned that a SAM site on the island had shot down a U-2 spy plane, killing pilot Major Rudolf Anderson, who had been the pilot to take the first pictures demonstrating the existence of the missiles in Cuba. This, combined with the letter, proved to the military that the Soviets were preparing for all out war. The President stopped the group discussion to remind them that he was not “concerned with the first step,” but was concerned with the “fourth or fifth” step that would end in nuclear war (Kennedy, 74). The President was not going to be railroaded into making a hasty decision. He was still afraid of stumbling into war because of mistakes in judgment. With the completed letter, Bobby met with Ambassador Dobrynin to personally hand him the letter. The President also instructed Bobby to warn Dobrynin that they would commence air strikes on Monday if they did not receive a reply in 24 hours. The military was chomping at the bit to invade and were ready to do so at any given moment. The President was concerned, too, about the Soviets using this as a ruse to buy more time to complete the sites. When Bobby returned, the President was in the pool having his afternoon swim. The President was thinking of Major Anderson and his family. He had learned that Major Anderson had a child the same age as John, jr. He also cursed the fact that the young and brave always die in war, while the politicians sit in the comfort of their homes and plan war. Bobby remembered that the President was also very concerned about the children, “who had no say, who knew nothing of the confrontation, but whose lives would be snuffed out like everyone else’s.” (Kennedy, 81) With this in mind, he sent Jackie and the kids out of town for their safety in the event that Washington was attacked. With a heavy heart, the President went to bed late that Saturday night. The President was surrounded by people who were intelligent and loyal, but they often made mistakes in judgment. The two people he trusted the most were his brother Bobby and Robert McNamara, who both advocated for the blockade. 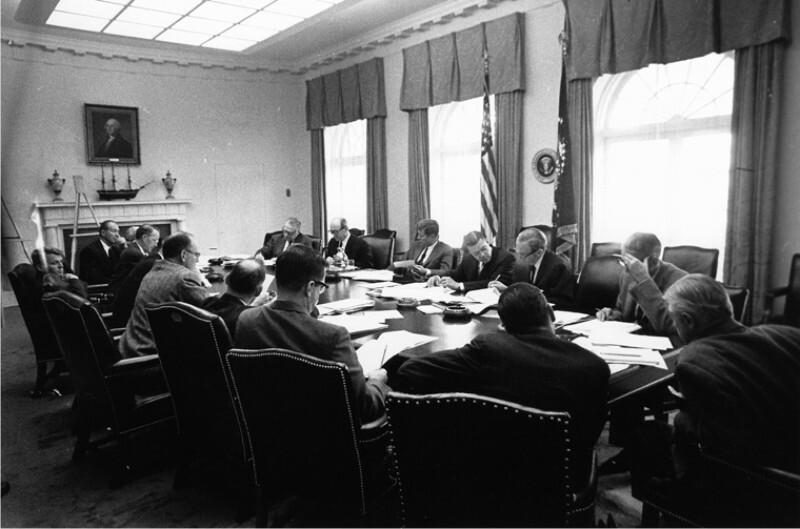 Though the ExComm was originally in favor of air strikes, Bobby and McNamara were able to convince the group that initial limited pressure was necessary before a major strike could be carried out. The JCS were very insistent that the President follow their course of action, but the President had learned the painful lessons of the Bay of Pigs crisis. He would not allow himself to be taken for a fool again. In the end, it was the President’s careful analysis and judgment that averted all out war. President Kennedy throughout the crisis was dedicated to thinking about the decisions and reactions of Khrushchev. Empathy was a quality that the President had, but he also demanded it of those individuals around him. The JCS did not have this sense of empathy, which the President was all too aware of. He knew that if he were to make decisions without thinking of the Soviet reaction, then he might unwittingly force them to respond in ways that would force them to escalate the tensions. In Robert McNamara’s book In Retrospect, he explains how the Cuban Missile crisis is a model for how to empathize with one’s enemy in order to avert war. After this crisis, the Soviet Union and the U.S. established a hotline so that the two sides would not have to second guess one-another. Barbara Tuchman’s book The Guns of August had a huge impact on the President’s decision making. He was a lover of history and he was very concerned, as most President’s are, of how they will be remembered by posterity. He was frightened by the thought that individuals could make mistakes in judgment that could result in war, such as had been the case in World War 1. The President was absolutely not going to allow similar mistakes to be made while he was President. In understanding the military pressures the President had to resist, it is not reasonable to conclude that the President was overly hostile or prideful, as the revisionists have asserted. Had he really wanted to demonstrate military might or vanity, he would have proceeded with an invasion. The existence of missiles in Cuba would have been the perfect pretext for invasion. However, he exercised restraint and wisdom in pursuing a path of peace. In the final analysis, President Kennedy possessed the right amount of judgment, empathy, and historical perspective to prevent the outbreak of nuclear war. To further illustrate the Cold War mentality to invade, we must remember that Richard Nixon, former Vice President and Kennedy’s opponent in the 1960 Presidential election, criticized the President as being to soft during the crisis, and added that if he were President he would have approved the use of surgical air-strikes to remove the missile sites. Having the benefit of decades of research and conferences involving top officials from both sides of the confrontation, we now know that if the United States had invaded Cuba the Soviet commanders on the ground in Cuba would have retaliated with tactical nuclear warheads, which would have resulted in a mutual nuclear destruction. Had it not been for President Kennedy, that surely would have been the outcome of the crisis. Beschloss, Michael. The Crisis Years. New York: Edward Burlingame Books, 1991. Blight, James G. Cuba On the Brink. New York: Pantheon, 1993. — On the Brink. New York: The Noonday Press, 1989. Cuban Missile Crisis and the Aftermath. 20 January 2001. State Department of the United States. 3 March 2008 <http://www.state.gov/www/about_state /history/ frusXI/26_50.html>. Dallek, Robert. An Unfinished Life. Boston: Little Brown and Company, 2003. Hagan, Roger. “Cuba: Triumph or Tragedy?” Dissent 10 (Winter 1963): 13-26. Historic Documents: ExComm Meetings. CNN.Com. 3 March 2008 <http:// http://www.Cnn. com/SPECIALS/cold.war/episodes/10/documents/excomm/1018.html>. Kennedy, Robert F. Thirteen Days. New York: W.W. Norton & Company, 1969. McNamara, Robert S. In Retrospect. New York: Vintage, 1995. Medland, William J. 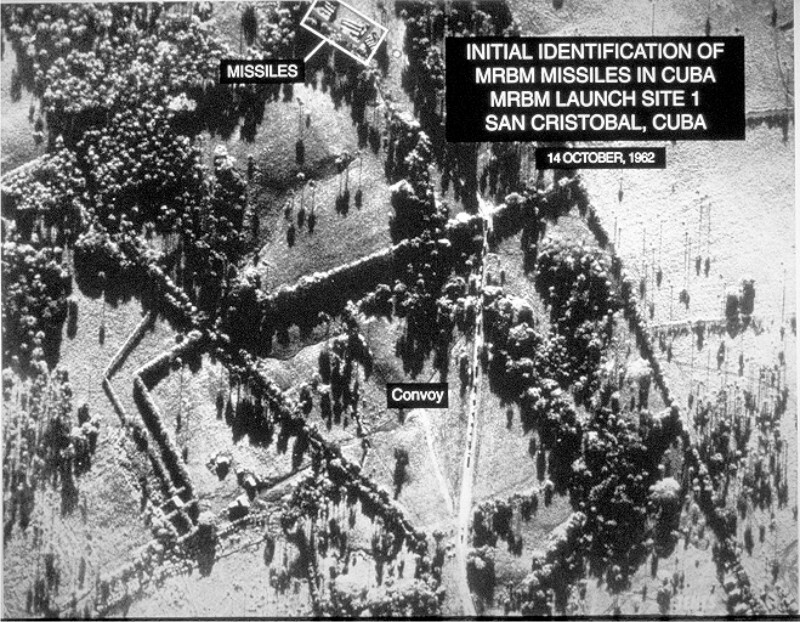 “The Cuban Missile Crisis: Evolving Historical Perspectives.” The History Teacher, Vol. 23, No. 4. (Aug., 1990), pp. 433-447. National Security Archive. 1997. The George Washington University. 3 March 2008 <http://www.gwu.edu/~nsarchiv/nsa/cuba_mis_cri/audio.htm>. Paterson, Thomas G. “Bearing the Burden: A Critical Look at JFK’s Foreign Policy.” The Virginia Quarterly Review 54 (Spring 1978): 193-212. Schlesinger, Arthur M. A Thousand Days. Boston: Houghton Mifflin, 1965. — Robert Kennedy and His Times. Boston: Houghton Mifflin, 1978. Statement By President John F. Kennedy On Cuba. U.S., Department of State. 3 March 2008 < http://www.mtholyoke.edu/acad/intrel/jfkstate.htm&gt;. Strober, Gerald S. and Deborah H. “Let Us Begin Anew”. New York: HarperPerennial, 1993. Talbot, David. Brothers. New York: Free Press, 2007. Tuchman, Barbara. The Guns of August. New York: Ballantine Books, 1962.